Using safe natural cures for heartburn remedies can immediately ease the pain and discomfort associated with this condition. Being forearmed with knowledge of what heartburn is, its causes and its symptoms, helps to effectively avoid it, or eliminate it, when it occurs. Although the word “heart” is partially used in its label, this organ doesn’t actually play a role in heartburn. However, its symptoms often mimic heart pain, which can lead to the mistaken impression that the heart is actually affected. 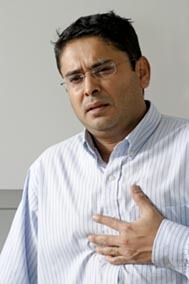 Heartburn, also referred to as GERD, is actually an irritation that occurs in the esophagus, which is caused by acid emanating from the stomach. In some cases, the lower esophageal sphincter does not close the way that it should or it can open too often. Such allows the acid from the stomach to travel into the esophagus, which causes heartburn to occur. While this is not usually a serious condition, if it occurs on a regular basis and is left untreated, more serious problems can develop, such as esophageal cancer. Symptoms typically occur after eating and can last for a few minutes up to several hours. Dissolving half or a full teaspoon of baking soda in a glass of water is also a good heartburn remedy. However, because baking soda has a high sodium content, this remedy should be used sparingly and it is not advisable for pregnant women. While these home remedies and natural cures are considered to be a few of the best used to cure heartburn, if symptoms appear to be chronic or do not improve, it is recommended that medical attention be sought. Those in need of heartburn remedies are advised to determine the cause of their symptoms and avoid its triggers as often as possible. Further, a holistic lifestyle, which targets good overall health, is always recommended. Eating a diet consisting mainly of naturally prepared vegetables and fruits, while avoiding all processed foods is the best way to not only cure heartburn, but to also avoid other common ailments that threaten the quality of one’s life.